In this region, autonomous vehicles could make its commercial debut in Singapore as early as 2018 while Japan, China and South Korea are in various stages of development to introduce connected and automated vehicles (CAVs). But what about the rest of Asia? Is the road infrastructure in Thailand and India ready for autonomous vehicles? How about the vehicle regulations, safety initiatives and insurance cover in Indonesia and Taiwan? The 2nd Autonomous Vehicles Asia Summit 2018 will focus on market case-studies of existing and possible markets for autonomous vehicles, OEM vehicle trials including buses, cars and trucks, and technological innovations that will drive the industry. 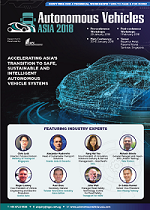 Autonomous Vehicles Asia 2018 is the only summit focusing exclusively on autonomous vehicles development and commercial deployment in Asia-Pacific. It is your one-stop gathering of professionals across the entire autonomous vehicles value-chain in Asia-Pacific, with dedicated speed networking sessions to help build your network. View the agenda to see the full speaker lineup, sessions, case studies and more! With only one month left until the discount expires, do not miss this great opportunity and register today! To register and save with the early bird discount, Simply click here to register, or call +65 6722 3939.